When I was growing up on the farm in the 1950s and 1960s, I never heard that name – “Bovina” – and indeed only discovered it after maps and Tama County history books became available online. There is a grouping of about four houses and farms at this site (see aerial photo from Google maps above right, and click on it to see a larger version). When I was growing up Barney and Regina Beenken’s farm was part of that group, and the Drapers lived across the road from them. Alec Green* lived in a house just a bit north of them, at the intersection of what is now known as 110th Street and R Avenue*. I suspect, at some point about this time, the north-south railroad came through the area. That railroad was routed through Buckingham to the south and through Voohries to the north, but bypassed Bovina, running about a half mile to the east. That probably spelled the end for Bovina, and people moved to towns on the railroad. Click here to download a document where I’ve collected a bit more information about the history of Bovina. Alec Green was brother to Mary Green. Both emigrated from County Donegal, probably Inch Island, Ireland. They are distant relatives through the Greene (with an “e”) family on Inch and via Mary Boyle, Bill’s great-grandmother. We met Greene family relatives on Inch each time we visited the Island. The roads didn’t have names – at least names which I knew – when I was growing up. When 911 service came to Tama County, every road received a name and every farm and house received a street address. 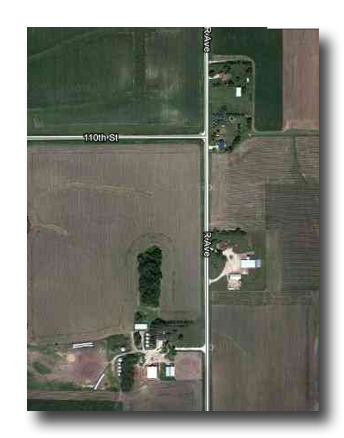 So our farm, which was simply Rural Route 1, Traer, Iowa, when I grew up, became “1067 P Avenue, Traer, Iowa”.